Figure 7-48. - Standard markings and connections for a delta- connected dual-voltage motor. 1. Connect lead T7 to TI and to line lead LI. 2. Connect lead T8 to T2 and to line lead L2. 3. Connect lead T3 to T9 and line lead L3. 4. Connect T4, T5. and T6 together. HIGH VOLTAGE. 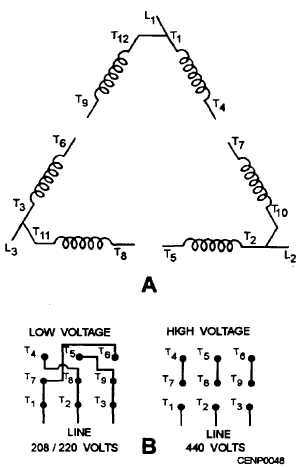 - For high-voltage operation, connect lead T4 to T7; connect lead T5 to T8; connect lead T6 to T9; connect T1, T2, and T3 to LI, L2, and L3, respectively. LOW VOLTAGE. 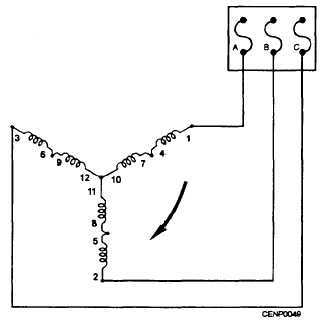 - For low-voltage operation, connect leads Tl, T7, and T6 to the line lead LI. Connect leads T2, T4, and T8 to line lead L2. Connect leads T3, T5, and T9 to line lead L3. For reversing three-phase motors, figure 7-49 shows the three leads of a three-phase motor connected to a three-phase power line for clockwise rotation. To reverse any three-phase motor, interchange any two of the power leads. This section covers common electric controllers. The term controller includes any switch or device normally used to start or stop a motor. Controllers are classified as either manual or magnetic. The manual controller uses a toggle mechanism, moved by hand, to open or close the circuit. It may be a switch, a disconnect, or even an attachment plug. Magnetic controllers use a magnetic coil to move the mechanism which opens or closes the circuit. Magnetic controllers are operated manually by pressure on a button or automatically by a pressure switch or a similar device. The controller must be within sight of the motor, unless the disconnect device or the controller can be locked in the open position, or the branch circuit can serve as a controller. A distance of more than 50 feet is considered equivalent to "out of sight." Figure 7-49. - Wye-connected motor to three-phase power for clockwise rotation.